So when GreenWorks asked me to try out their new 60-Volt Self-Propelled Cordless Electric lawn mower, of course I jumped at the chance. I was skeptical about how this mower would compare to the lightweight 40V mower that I am used to. But I went into the trial with an open mind, and I am pleased to present the results. 20V difference in battery capacity (I double checked with a calculator, so I know this is accurate), which means more power and longer run time. 40V mower has room for two batteries, while the 60V mower has one slot. 40V mower has a plastic body, while the 60V mower has a steel body. 40V mower is manual push, while 60V is self-propelled. 40V mower has two short blades with a combined 20" cutting path, while the 60V has one blade with a 21" path. 40V mower has 5 cutting heights, while the 60V mower has 7 cutting heights. 40V mower has mulching/bagging features, while the 60V has mulching, bagging, and side discharge. Our house is on almost one quarter of an acre, so I was leery as to whether one battery could handle all of that grass, especially with the additional energy spent on the self-propelled feature. I could not have been more surprised or pleased. Not only did the battery have enough juice to handle the grass, but I also was able, on a single charge, to mow the overgrown border in the alley adjacent to our house, trim the grass around several trees (grass growing in the rocks, long story...), and let Big E try it out to see how she could handle it. So on the battery performance, this mower gets a big thumbs up. The self-propelled feature is something that I would normally think of as a nice add on (something I would take, but not necessarily go out of my way to find). However, there are several aspects that make this feature absolutely amazing in GreenWorks' new mower. First of all, unlike many self-propelled mowers, this one offers a speed adjustment. This means that when I'm mowing, my freakishly long legs can keep up with the faster pace, but this can be slowed down when another , shorter family member is mowing (I'm looking at you, Big E). I found the slower pace to be helpful for my daughter, as she is just learning to mow, and she is able to keep the mower going in a straight line with the slower speed. Because of the self-propelled feature, my nine-year-old has been able to help out with mowing for the past couple of weeks. This mower is simple to use, and it essentially does the work for you. So Big E was able to guide the mower up and down the yard.The handle has simple spring pin adjustments, so I can mow the perimeter of the yard, and easily snap the handle down to my daughter's height when it's her turn. And then (and this might be my favorite new feature), when the mowing is complete, the spring pins can be pulled and the handle locked across the body of the mower so it can be stored vertically. If you try that with your gas powered mower, you will end up with gas and oil all over the floor. The storage foot print for this mower is about 24" by 8", or about the size of two pieces of paper. Think of all of the extra stuff you can fit in your garage or shed because this mower stows vertically! As of the publication of this article, this mower has not been released for sale, so I am not sure what the price point will be. Regardless of what the cost is, remember that you will not have to pay for gasoline, oil, spark plugs, fuel lines, or tune ups. It is clean and quiet. If you haven't mowed without exhaust fumes, it is truly cathartic. All you get to smell is fresh cut grass and your own body odor. You also won't have to pay for the gauze and ointment for covering the burns sustained from touching the hot manifolds, because there is no heat generated. No dead grass from spilled gas when you're trying to remove the blade for sharpening, no tennis elbow from loud, rattling motors. In fact, I can mow before 6AM or after 8PM without disturbing my neighbors or my own sleeping kids. To be honest, I really had to search for anything negative about this mower. 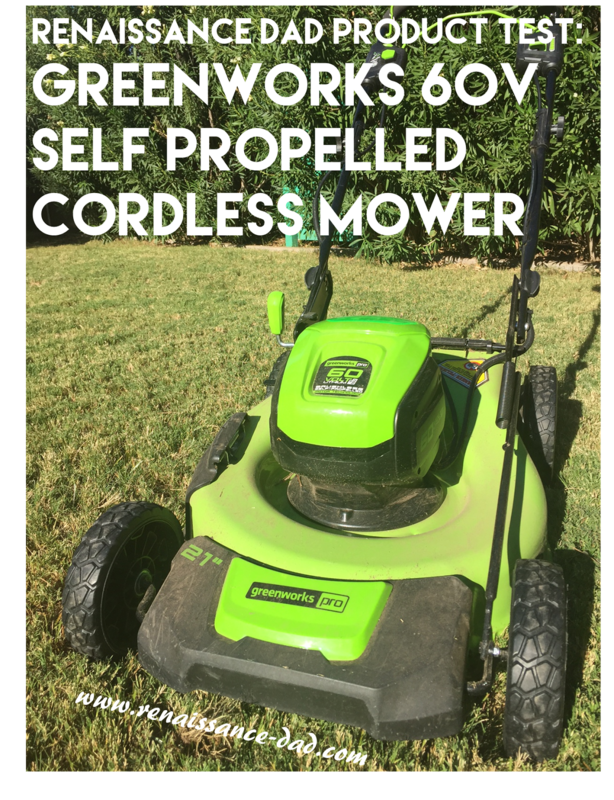 I really feel that, once again, GreenWorks has produced a product that is able to compete against gas powered equipment, and this mower really raises the bar. If there are any negatives to be found, it is in the weight of the mower. Weighing in at just under 90 pounds, this thing is a beast. However, once it is out of the box and on its wheels, it does not feel heavy at all. 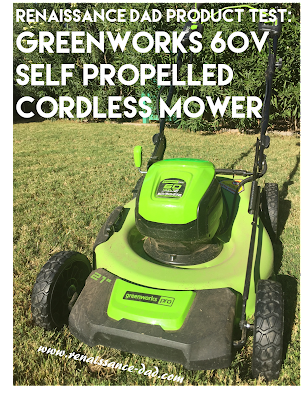 While I really want to continue to be content with my 40V battery mower, the GreenWorks 60V Self-Propelled mower seems to set a new standard for battery-powered lawn equipment. I don't think I will have to borrow a gas mower to scalp my yard this year when it comes time to put in my winter lawn, as this mower seems to have as much power as its gas-powered counterparts. And, to be honest, if you have kids and want to start them early with mowing, this is a great mower to get them going. GreenWorks, you knocked this one out of the park. The only thing missing is a radio controller that would allow me to mow while sitting on the patio with a refreshing beverage.